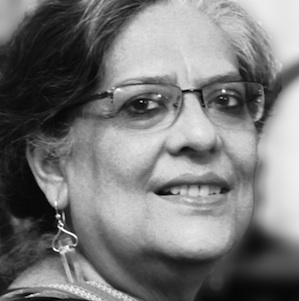 Geeta Kapur (b.1943) is a Delhi-based critic and curator. She studied at the University of Delhi, New York University and Royal College of Art, London. Her writing on contemporary art and cultural theory include widely anthologized essays on alternative modernisms and national paradigms; issues of representation and forms of critical contemporaniety; the positioning of interventionist artworks and related curatorial initiatives in India and the global south. Her texts appear frequently in international publications. Her books include Contemporary Indian Artists (Delhi, 1978), When was Modernism: Essays on Contemporary Cultural Practice in India (Delhi, 2000) and Ends and Means: Critical Inscriptions in Contemporary Art (Delhi, 2010). One of the founder-editors of the Journal of Arts & Ideas, she is advisory editor to Third Text and Marg. Geeta Kapur has lectured in India and worldwide in academic institutions. This includes Clare Hall, University of Cambridge, St Anthony's College, University of Oxford, Royal College of Art and University of London in Britain; in the USA at Duke University, Columbia University, the School of the Art Institute of Chicago, Whitney Study Programme and University of Pittsburgh; in Canada at McGill University, Montreal; at the University of Sao Paulo in Brazil and Institute of Higher Studies in Art, Caracas, Venezuela; and in Australia at the Australian National University, Canberra, University of Sydney and University of Melbourne. Her curatorial work in international venues includes the co-curated Festival of India exhibition Indian Contemporary Art at the Royal Academy of Arts, London; Dispossession, the Indian section in the First Johannesburg Biennale (1995); the co-curated "Bombay/Mumbai" for the multi-part exhibition Century City: Art and Culture in the Modern Metropolis at the Tate Modern, London (2001); and subTerrain: artworks in the cityfold for the body.city project at the House of World Cultures, Berlin (2003). She has also curated at state venues in India like the Lalit Kala Akademi, Delhi, and the National Gallery of Modern Art, Delhi and Mumbai. She was a member of the International Jury of the 51st Venice Biennale (2005); the ninth Dakar Biennale (2006); and the eighth Sharjah Biennale (2007). She is a member of the Asian Art Council, Guggenheim Museum, New York. She was invited to talk and conduct a dialogue with Catherine David at 100 Days 100 Guests, Documenta X, Kassel (1997); and "Where Art Worlds Meet", International Conference for the 52nd Venice Biennale (2005). In 2009, she spoke at the annual conference of CIMAM, held in Mexico City. Museum venues where she has spoken include, Museum of Modern Art, New York; Guggenheim Museum, New York and Bilbao; Art Gallery of Ontario, Toronto; Tate Britain and Tate Modern, London; Irish Museum of Modern Art (IMMA), Dublin; Stedelijk Museum, Amsterdam; Museum of Contemporary Art (MuHKA), Antwerp; Louisiana Museum of Modern Art, Copenhagen; Museum of Contemporary Art (MACBA), Barcelona; Institut Valencia d'Art Modern (IVAM), Valencia; Ernst Museum, Budapest; Art Gallery of New South Wales, Museum of Contemporary Art, Sydney, and Queensland Art Gallery, Brisbane; also at Mori Art Museum, Tokyo; Museum of Contemporary Art, Tehran; and Shanghai Art Museum. She has spoken at public galleries such as Haus der Kunst, Munich; House of World Cultures, Berlin; Whitechapel Art Gallery, London; Asia Society, New York; at conferences staged alongside biennales and international exhibitions in Havana, Johannesburg, Baghdad, Sharjah, Jakarta and Adelaide; and at different forums in the former USSR and Pakistan. Geeta Kapur has held fellowships at the Indian Institute of Advanced Study, Shimla; Clare Hall, University of Cambridge; and Nehru Memorial Museum and Library, Delhi. She has been invited as Visiting Professor at the Jawaharlal Nehru University and the University of Delhi. She was awarded the Padma Shri by the Indian state in 2009.